Professor Jonathan Nash, the first recipient of the David J. Bederman Research Professorship; image courtesy of Emory Photo Video. The late K.H. 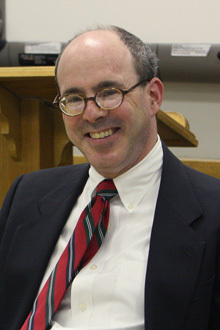 Gyr Professor of Private International Law David J. Bederman; image courtesy of Emory Law. Today, Emory Law announced the establishment of the David J. Bederman Research Professorship and its first recipient, Jonathan Nash. The professorship will be awarded annually to recognize the outstanding contributions of a faculty member and offers a course release to foster increased scholarly work. Nash's work focuses on federal courts and jurisdiction, and environmental law. He plans to use the time afforded by the professorship to study “how federal judicial selection works where senators of different parties each have responsibility for recommending judicial nominees to the same president.” A second project will examine the standing of members and houses of Congress to seek judicial relief. Also this fall, the law school will open applications for the David J. Bederman Fellowship in International Law, which will allow two Emory Law students annually to attend the Summer Programme at The Hague Academy of International Law. The first students are expected to attend in 2015. The professorship and fellowships are named in honor of the late K.H. Gyr Professor of Private International Law David J. Bederman. The David J. Bederman Fund also supports the annual David J. Bederman Lecture. The inaugural lecture was delivered by Bederman himself on Sept. 26, 2011. In 2013, the guest lecturer was U.S. Ambassador-at-Large for War Crimes Issues and former Prosecutor of the Special Court for Sierra Leone Stephen J. Rapp. Last year, Fatou Bensouda, chief prosecutor for the International Criminal Court, was the speaker. The law school expects to announce the spring 2015 lecturer later this fall. Bederman was both a world-class scholar of international law and a beloved professor, who taught an estimated 4,000 students during his 20 years at Emory Law. Beyond his gifts as a prolific writer and teacher, he also excelled in practice, enjoying the uncommon experience of arguing before the U.S. Supreme Court four times. Bederman's erudition, coupled with relentless preparation, made him a formidable attorney. His own study allowed him to see longstanding doctrine on different planes and to engage his students in ways that few others could. Appropriately, his legacy at Emory Law furthers research and scholarship, as well as student learning, and highlights the accomplishments of lawyers who are experts in the practice of international law. Before Bederman's death on Dec. 4, 2011, at age 50, the law school established the David J. Bederman Fund. His fellow faculty pledged $100,000 within a week. Gifts from his friends, family, former students, and the Emory community have since increased the endowment to approximately $750,000.